It looked like a broken America was turning a corner. After a lethal virus took out huge chunks of the country's population and plunged the US into chaos, the Division stepped up. Sleeper agents trained for the worst, they took up their guns and set about trying to restore order. After the events of The Division 2's predecessor, it they seemed to be succeeding. But now, a new threat has risen up and dark fascistic forces have taken the nation's capitol, with its leadership nowhere to be seen. 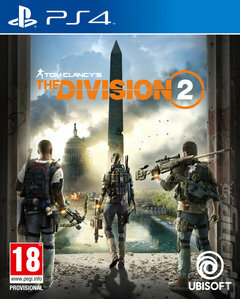 Washington DC is the new city for you to explore and conquer in The Division 2. Like the first game in the series, this is an open world action RPG with a serious focus on loot and scavenging. You'll scavenge through the ruins of a broken city, wading through flooded urban areas and having shootouts in the wreckage of iconic national monuments. This isn't the city you've seen in the movies. Despite (and because of) the hard times DC is facing, expect to find a living, breathing city full of survivors doing their best to survive. They're all on the hunt for resources such as ammo, food and medicine, and as factions clash you'd better believe this city will throw up some surprises. If you work with the civilians to keep them safe, though, they'll come to your aid and help build up your base. Ubisoft Massive, the developer behind this epic, says it was built with an 'endgame-first mentality', meaning that even once you've completed the main campaign there will be plenty more to do and explore. A year of free post-launch content, including story-focused missions, new gameplay modes and map expansions will help, of course! Once you get through it you'll get access to new specialisations too, with skillsets such as demolitionist, sharpshooter and survivalist up for grabs. They each come with their own progression system with new skills, mods and talents available. The Dark Zone, of course, makes a comeback. This time, there are three of them - areas that promise the best loot accompanied by endless tension thanks to the ever-present threat that the other players you encounter there could turn on you to take your resources at any moment. This time Ubisoft has leveled the playing field, with player stats getting normalised when you enter a Dark Zone so that it's a level playing field. Unless you choose to step into one of the 'occupied' zones. On a rotating basis one of the Dark Zones will stick to the original formula with no flattened stats and an even greater sense of peril. This is a near-future that's all the more exciting and terrifying for its plausibility!